2005 was a great year with Chayo Blue Thunder (Blue) finishing the year as the UK No. 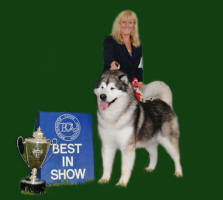 1 Malamute for the third consecutive year! Blue was also runner-up Top Rare Breed 2005. Thank you to all the judges who thought so highly of 'Blue'. Following in his Dad's footsteps, Chayo Dom Perignon (Louis) also made us proud by ending 2005 as the UK Joint Top Malamute Puppy. Thank you to all the owners who have campaigned Chayo dogs throughout 2005.